4x4 beach driving & general sand driving. Western Australia is ideal for 4x4 beach driving, compared to the other states and territories we have a large amount of beaches and sand dunes you can explore. This means we have an abundance of fishing spots, surfing spots, sand dune formations and good long stretches of beaches to enjoy. A lot of these beaches require a 4WD in order to get them. Just 90kms north of Perth is Lancelin. Lancelin has a huge area of sand dunes to have a play around on and just a 45 min drive further north of Lancelin via Indian Ocean drive is Wedge Island another huge area of sand dunes. Fun fun fun! 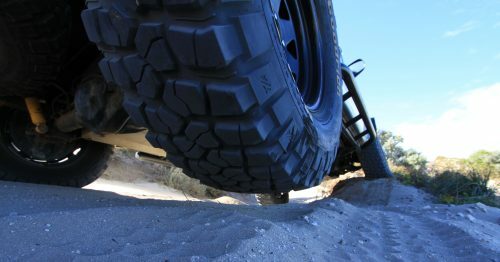 Remember to deflate your tyres before venturing onto sand for 4x4 beach driving, whether it is the beach, sand dunes or just sand tracks. Too many people leave their tyre pressures too high and chew up the tracks and get bogged, these people are usually recovered by someone using the correct tyre pressures. Before you make your way to these places, make sure you take a compressor with you, you will need it to pump the tyres back up to highway pressures when you leave. Driving on the highway or black top with low tyre pressures will damage your tyres and reduce handling and breaking. Pressures will vary due to your vehicle's weight, tyre size and tread pattern. 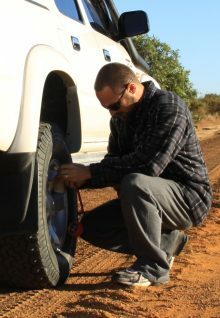 Deflating the tyres when you go 4x4 beach driving is the easy part. You can go cheap and use a match or a stick or you can use special tyre deflators, some remove the valve completely, this way you will deflate about 1 psi per second, others are screw on deflators which can be preset to your required psi, you can even use a pressure gauge to deflate as some of them have a deflate button (they take a long time), always use a tyre pressure gauge to check the pressure after deflating (even if you use the preset types), to ensure you have the same pressure in all 4 tyres. Sometimes you will need to run slightly lower psi in your front tyres compared to the rear as most of the weight is usually on the rear and will make the tyre footprint bigger than the front already. Deflating tyres before sand driving. Low pressures increase the chance of rolling/popping your bead (tyre slipping of you rim). Keep in mind that if you go lower than 15 psi there is a bigger chance to roll the tyre off the rim on most four wheel drives. Usually this will happen to your front wheels but can still happen on your rear wheels as well. I personally don't go under 15psi, when I go 4x4 beach driving, unless I really have to and as soon as I'm out of the situation which requires my Psi to be lower than 15, I will pump the tyres back up to at least 15psi. Make sure you do not use excessive speed in the sand, stay in the tracks if there are any and do not turn too sharply when up in speed. A lot of rollovers happen doing 4x4 beach driving or in the sand so do take care or you could end up with extensive damage to your vehicle or worse injuring somebody. Do not accelerate too fast when taking off in the sand, this will make your wheels spin and you will dig yourself into the sand and the same applies when you brake to stop. The best way to come to a stop is to put your 4x4 in neutral and coast to a stop without using your brakes at all, unless of course you need to stop in a hurry. If you get stuck when you take off, ease off the accelerator at once and do not attempt to do a turn at the same time as taking off, the tyres have to push a lot more sand aside if you turn your steering wheel. Make sure the tyres are parallel with the car or you could roll your tyre off the bead. Salt and metal do not mix. Make sure you know when the tide is coming in if you are spending the day on the beach 4x4 beach driving. You do not want to be caught out by the tide. This is very important if travelling a fair distance along the beach and you have to travel back the same way. Those narrow parts of beach on your journey may be under water on your way back. If you get caught out you may be stranded and/or risk getting stuck in the water. After a day at the beach it's a good idea to wash underneath your 4x4 (and the rest of it while you have the hose handy), this is to get rid of any salt water, sand and dust. If you’re on a trip for a few days or a week it shouldn't damage your 4x4 as long as you give it a good wash when you return home. Must have items for sand driving. Leave 4x4 beach driving And Go To Home Page.